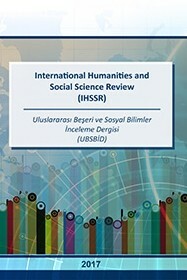 International Humanities and Social Science Review (IHSSR) is a biannually indexed scientific open access journal for the publication of research and studies covering all aspects of all social sciences. The aim and scope of the journal are support and publish research and studies in those fields and giving priority to those have a strong conceptual framework together with a critical examination of literature, proper research design, contemporary techniques of analysis, and suggestions for both future theory and practice. IHSSR is willing to publish peer-reviewed research and studies without a fee that consider social sciences theoretically and offer an insight into practice. From this perspective, individual research and studies from different disciplinaries, experimental and clinical studies, letters and case studies are published. IHSSR is licensed under a Creative Commons Attribution-NonCommercial-NoDerivatives 4.0 International License.